SCOOP/STACK Plays Performing Better Than Competition: How Is This Possible? STACK is an abbreviation for “Sooner Trend Anadarko Canadian Kingfisher.” It is situated within the Anadarko Basin. Oil experts say it is the most promising oil field in Oklahoma. However, the most drilled formation in the basin is the Woodford Shale. Other Oklahoma oil reserves include Oswego, Osage, Chester, Meramec, and Hunton. All these formations lay on top of each other. The Meramec formation is different from the others because of its over-pressured oil and low water levels. This, in turn, has created incredible IP rates with reduced costs of water disposal – the primary reason oil operators have drilled the formation heavily. Oklahoma boasts of some of the most lucrative oil fields in the US. These locations feature advanced infrastructure that makes transportation of oil and gas more comfortable. Being an important distribution hub in the country, Oklahoma’s oil and gas industry allows oil operators to increase production using the existing takeaway capacity provided by the government. However, stack Oklahoma plays’ success can be attributed to their geology. Each play has strong well initial production rates (IP rates) and affordable drilling costs. Moreover, the stack oil play formation allows oil drillers to exploit oil fields at varying depths, allowing for more oil extraction from the spacing units. 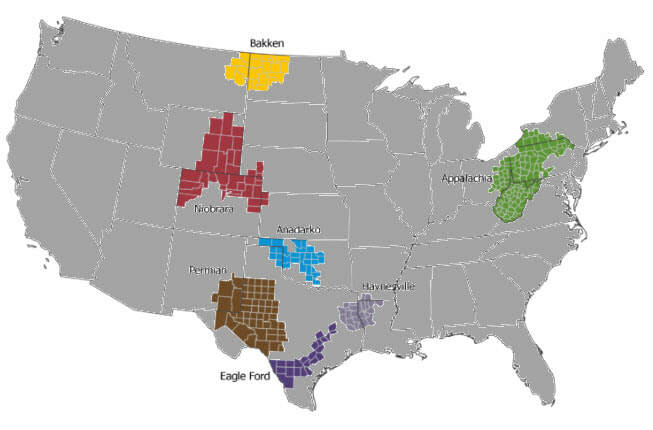 The SCOOP/STACK formation is part of the larger Anadarko Region. According to EIA predictions, the region is expected to yield 500,000 barrels of oil per day, toward the end of 2018. The report also indicated that the region has the potential to grow considerably given that more than 100,000 barrels of oil were produced per day, last year alone. IP means Initial Production. It represents the aggregate amount of oil produced within a stipulated period. The IP rate represents the first 24 hours of oil production from a well. Similarly, the 90- day IP refers to the first 90 days of production. The IP rate is critical when estimating the total output of a well, the rate of production decline, and the peak production of oil through a process called decline curve analysis. What is decline curve analysis? The decline curve analysis is a visual process designed to analyze decreasing production rates and predict future events in oil and gas fields. Horizontal exploitation of the stack oil play commenced in 2007 in the Cana-Woodford, with major extraction operations taking place in Payne and Logan counties. Toward the end of 2013, oil drillers discovered the Meramec formation and shifted their focus on essential oil fields in Blaine and Kingfisher County for several years later. The SCOOP is another crucial formation in the Anadarko Basin. The term stands for South Central Oklahoma Oil Province. SCOOP is located southeast of the STACK formation. The play was discovered in 2012. It shares the same formation as STACK, including Woodford and Hunton. Oklahoma’s geology is a bit complicated, especially The SCOOP play. However, with time, drillers have expanded their understanding of the region, with a majority of them hoping to breakeven prices for SCOOP. Most companies are targeting Springer, and Woodford plays. While SCOOP is perceived to be a stable oil region with EUR of approximately 2 million barrels of oil, 60% of total production in the wells could be natural gas. The STACK rocks are not the same as some oil wells break even as little as $35 per barrel, although this is not the case with other plays. How does SCOOP/STACK compare to other basins? Why are the formations in high demand? The Oklahoma oil plays are by far the most sought-after oil drilling hub in the United States. Advanced oil and gas infrastructure is one of the factors that make this area perfect for drilling. However, the play’s geology is the primary reason oil drilling investment firms are competing to exploit in the area. Each well has steady initial production rates (IP rates) and reasonable drilling costs. Moreover, the stacked features of these formations enable oil drillers to exploit different depths simultaneously for resources. Taking a keen look at the plays’ performance over time proves the region has experienced massive growth since 2017 and has been constant ever since. Furthermore, there has been an interest in the Merge and the NW STACK play regions. The two Oklahoma oil and gas plays have recorded more than 30% of drilling operations from 2016. Experts believe that these activities may lead to discoveries. The sudden growth in Oklahoma’s oil fortune is attributed to the new resource plays that have both conventional and unconventional formations. While Caney Shale, Mississippian, Cottage Grove, Hunton, and other areas continue to produce oil, the SCOOP/STACK duo has quickly become global hotspots. Moreover, other plays such as Merge and Sycamore, Caney, Osage Resource Expansion (SCORE). What does the future hold for this highly sophisticated oil industry? While these formations show much promise, every investor must consider other factors when calculating the viability of a particular oil field, such as costs if oil well operations, as well as infrastructure to and from the oil well. Nevertheless, the price is the most crucial factor that an investor expects to earn from oil and gas production. Even though SCOOP and STACK are still in their development stage, their overall potential has not been determined. Various evidence shows that the region is delivering outstanding results, compelling oil and gas companies to invest 2017 CAPEX to their growth. Oklahoma’s SCOOP/STACK is economical for many investors at current rates. The plays cover about 1/5 of the Permian Basin. They are an excellent alternative for investors who find the Permian’s cost of entry high and unavailability of acreage. SCOOP/STACK offer investments that generate cash flow. If you want to take advantage of SCOOP/STACK oil and gas investment opportunities, contact United Exploration, they will be able to assist you on how to go about it, but remember nothing in this article is to be considered tax or investment advice. Please consult with your attorney and tax professional.